Some sizes may take a bit longer to ship since they are in the SF studio. I will message you if this is the case with your order. 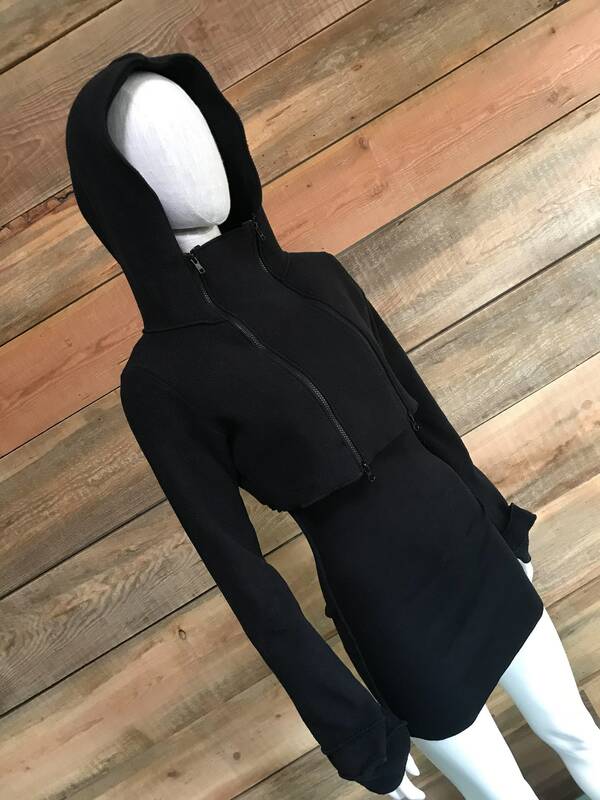 The fleece sculpture crop hoodie gives a sportie look to the Miranda Caroligne collection, and is one of few reproduced pieces in her typically OOAK work. 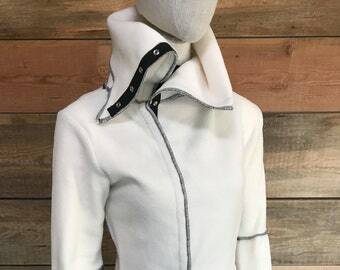 This pieces started as a pullover, morphed into a cropped jacket, and most recently is offered in a waist length version. The sculpture at the cuff is great coverage for chilly hands, especially when biking, while also just being an interesting detail. YKK zippers are specially cut for this collection by a sweet family company in NY. They zip up AND down, offering versatility in style, fit and cooling off. The center piece can be taken out completely to zip tighter, and making the hood fit tighter. This is good for those emergency beach romp adventures when the sudden wind catches in the hood. The fit is meant to be snug to the body, and best over light layers rather than bulky sweaters. 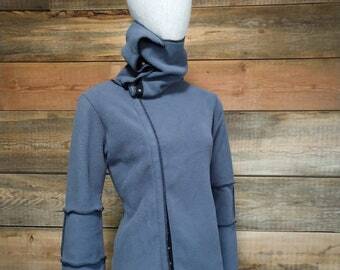 Exposed seams, sculptural “hand-hoodies”, and double zip closure give this jacket just enough style to stand out. 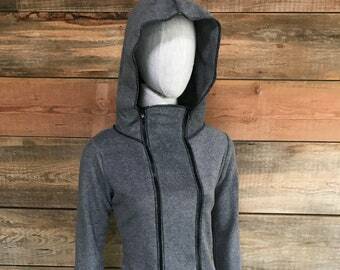 The piece is designed without pockets, due to the snug fit and cropped style. However, custom order is available for pockets patchworked on the exterior shoulder or elsewhere. 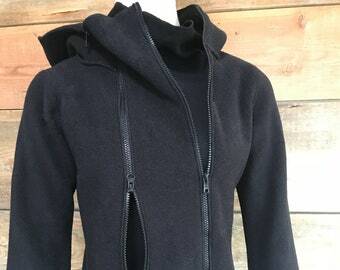 -Fabric content: Made in USA anti-pill fleece, stretches for comfort & fit. Machine washable in cold gentle, no dryer. Agitation and heat will pill even anti-pill fleece, as well as other materials. -Feel free to message with any questions or custom requests such as change of color, addition of pockets, slight measurement changes, etc. -Free alterations by appointment in San Francisco CA and Jacksonville (Applegate) OR. 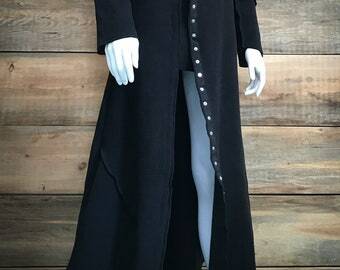 If you are considering an alteration, buy a larger size. Miranda Caroligne has been sewing most of her life, turning this past-time into a career after a bicycle accident rendered her unable to continue work as a physical therapist in 2003. Having an understanding of the body and its movements is evident in her clothing. Mostly working in recycled, upcycled, sustainable, reconstructed materials ... she ventured into fleece upon moving to San Francisco and frankly just being cold. 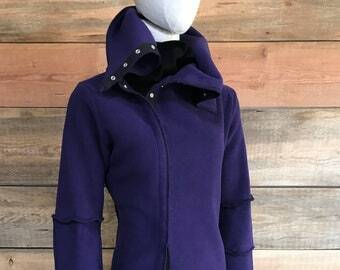 Her works in fleece immediately took off and a full line of fleece was eventually requested by a sales rep that walked into her San Francisco boutique. 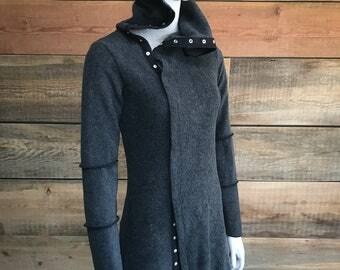 It remains the only “line” in production, as the OOAK sustainable pieces continue to be Miranda’s passion.